Why aren’t I eating more beans! I know beans are nutritious, high in dietary fiber and fat-free but not until doing a little research for this post did I realize all of the health benefits beans provide. Canned beans aren’t expensive but dried beans cost even less, don’t have the sodium and other additives that canned beans may contain and taste better! Eating beans is economical and pack a lot of health benefits. 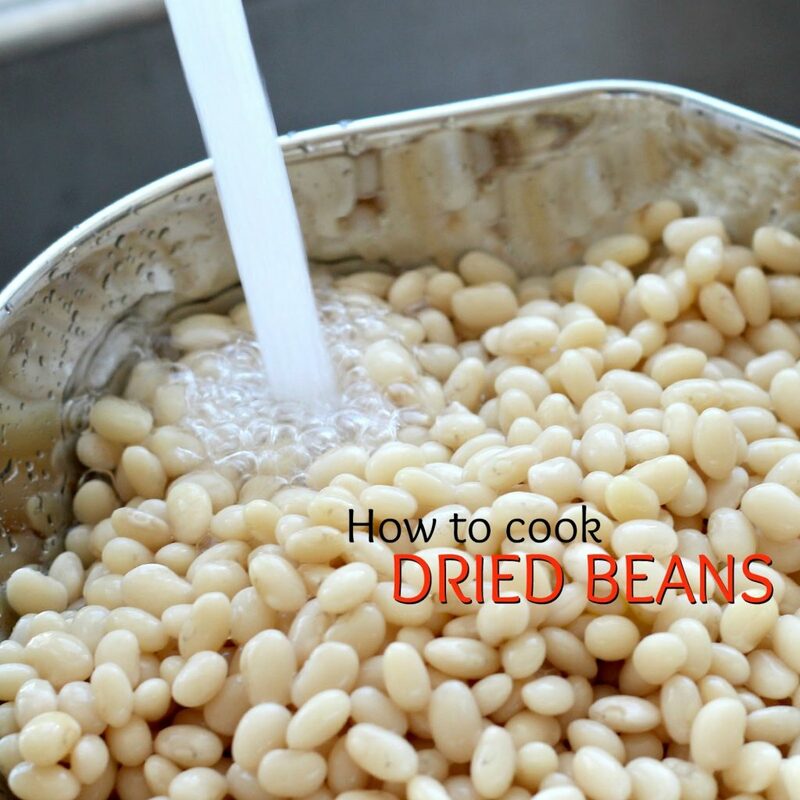 This easy, tutorial shows you how to cook dried beans for freezing, eating and recipes. Begin by sorting through the beans looking for small stones or other foreign objects and discard. Rarely do I fine anything but it is best to check carefully. Rinse by running cold water over the beans. It’s important to soak your beans before cooking them. Soaking reduces the cooking time and it breaks down the compounds in beans making them more digestible. 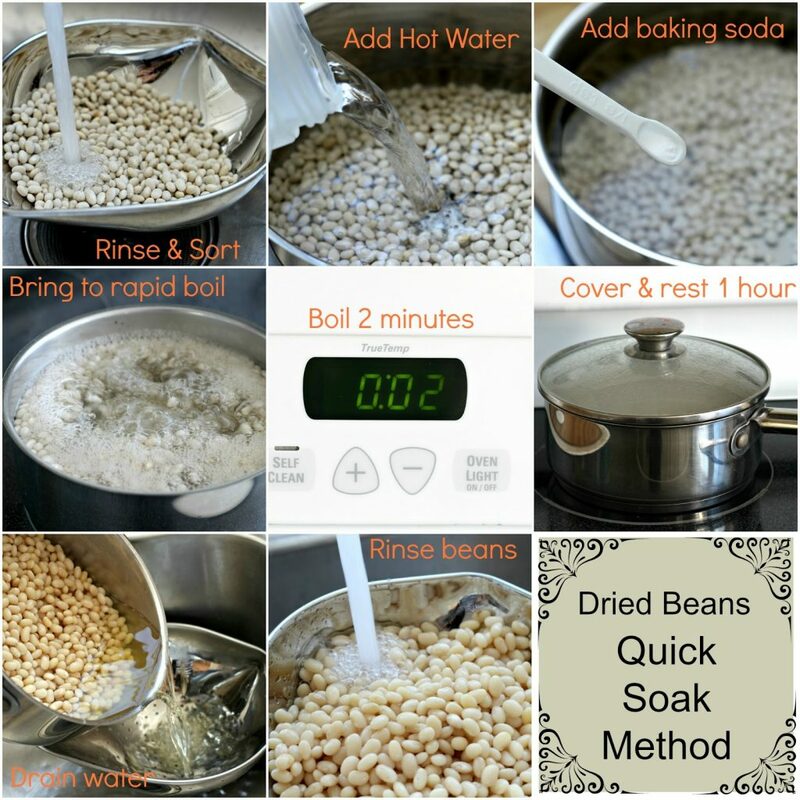 Here are two different ways to soak beans. Optional: adding 1/8 teaspoon baking soda can help soften beans, especially if you have hard water or the beans are a little older. After the beans are soaked, they are ready for cooking. Beans are done when they are tender, but not mushy. Fresher beans will cook quicker than older beans. Test by biting into one. Check the expiration date. Just because beans are dried doesn’t mean they last forever. Old beans lose their nutrition and sometimes will not become tender with cooking. Beans older than two years should be discarded. Cooked beans can be stored in the freezer for up to 6 months in an airtight freezer container. Beans are a member of the legume family that also includes lentils, peas, peanuts and soybeans. Navy beans are small, oval-shaped beans with white skin and a delicate flavor. They were named navy beans because of their inclusion in the US naval diet during the second half of the 19th century. My plate.gov considers 1 cup cooked beans to equal one cup vegetables. 1/4 cup of cooked beans equals 1 ounce protein equivalent. Beans are a good source of vegetable protein and fiber, which increased satiety, reduces hunger, and helps control appetite. Thank you for your wonderful post. I am trying to eat healthier in 2015. Recently, I bought dried beans but have never prepared or cooked them, now I have a wonderful visual. Hopefully, will be making your soup very soon. It looks delish. I haven't made beans this way in a LONG time, and this has really put me in the mood. I always soaked my beans because my mother taught me that's the way it was done, but I never knew why. Soo interesting. I generally added onion, celery, ham pieces and carrots to my beans…yum. Oh my…now I am really craving some, lol. Enjoy your week-end! We have beans quite often and I have discovered that navy or butter beans are even better when cooked in vegetable stock, with some onion and garlic. Delicious!! I love using beans in many recipes. Thanks for the great tips! We always use dried beans and we get a variety of those in India pre-sorted in packets. We are vegetarians, so beans and lentils are the main source of protein for us other than dairy products. I've been cooking with dried beans for many years here. I have also frozen them after cooking them for easy meal prep. 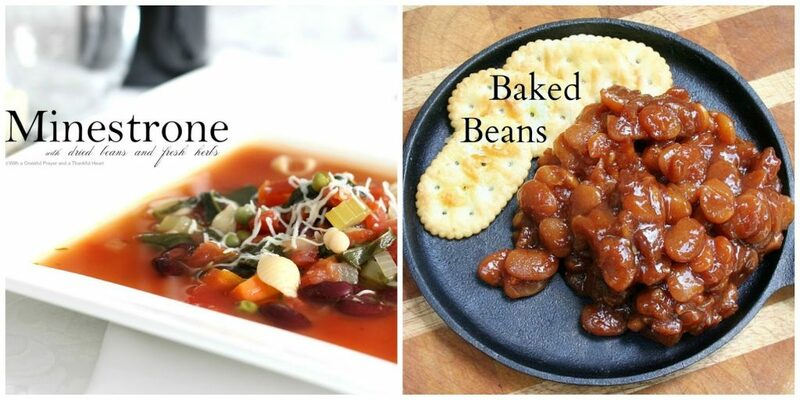 We avoid canned beans due to the sodium and non-organic ingredients. I'm thankful I have found organic dried beans. My hubby loves beans. I usually cook the mixed. I rarely soak which now I know is why our tummies get so upset! Thanks for the proper directions! How much baking soda did you add to the beans? I've not tried that before. 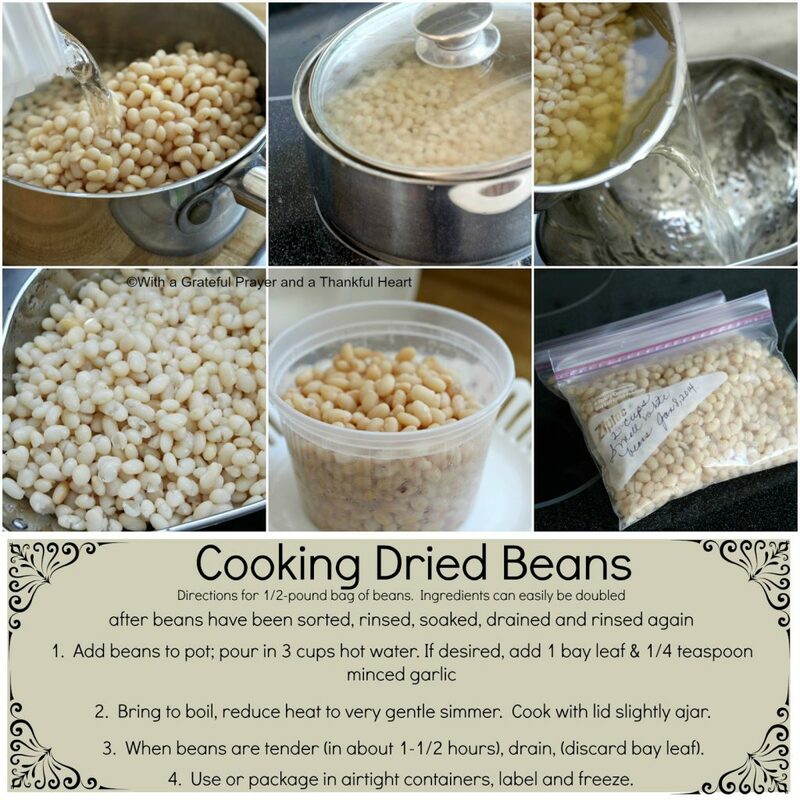 I love cooking with dried beans.